Washington's Secret War. The Hidden History of Valley Forge. 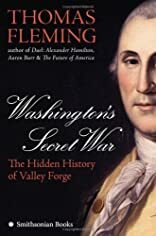 Washingtons Secret War: The Hidden History of Valley Forge was written by Thomas Fleming. Washingtons Secret War: The Hidden History of Valley Forge was published by Smithsonian Institution Press.